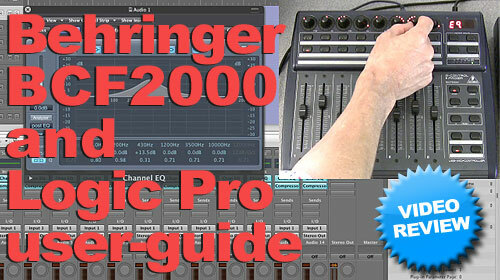 The BCF2000 B-Control Fader unit is one of Behringer's finest value-equipment inventions - Offering excellent control of all relevent features for most sequencers, this full featured user-guide shows you everything you need to know for use with Logic Pro, including tips along the way such as customizing the LED displays on the BCF pots, customizing controllers and more. This guide is in HD which may be only selecteable on the Youtube site - Here is part-1. If you've found this tutorial useful, please leave some comments or tips of your own below - thankyou. There are a total: 13 comments posted to this page. What about third party Instrument control. How can the Behringer be used for control of these? similar fashion to the built in Plug-ins in Logic. You also describe how the order can be changed in the CSParameterOrder.plist. You didn't mention third party software at all in your tutorial set. Does this mean they can't be controlled in a similar manner to the Logic Instruments and Inserts? Every teacher, I have two BCF2000, but try to many times are not normal use, the biggest problem is the first and second synchronous motor is moving, please tell me how to order them from the normal 1-16 ,,,!!! I'm using imac & LOGIC 9!Thank you! Are you also going to make a tutorials about using a BCF2000 and a BCR2000 with logic? rotary, instead of "F", for fader. That's where the problem started. (save for 8 faders vs. 16 rotary pots). Uh... No. dump the BCR on eBay, and pick up a BCF? Sad, since I really didn't want or need faders. Til then, I s'pose I'll just twiddle my knobs. mac to get it running please? place until I switch banks again. Can you help me out with this guys? Great great great video tutorials! with 10.8. Is this correct and if so, does that make the purchase of one a waste of money? get the pan rotors to work, for example. Has this been reevaluated for Logic 10 or am I doing something wrong? with Logic Pro 9. The presenter is very articulate and the explanations are clear.